Our Food Services Department assures that our district's students receive nutritional and enjoyable meals (both breakfast and lunch are provided). Parents can pay for their child's meals with our convenient online payment service. School lunch menus are updated monthly. The Fountain Hills Unified School District is proud to be part of the National School Lunch Program (NSLP). Lunches are required by NSLP guidelines to provide at least one-third of a child’s Recommended Daily Allowance (RDA) for calories, protein, vitamin A, vitamin C, calcium, and iron. Breakfast contains one-fourth of the RDA for these nutrients. On average, meals are planned to provide 30% or less of total calories from fat and 10% or less from saturated fat. 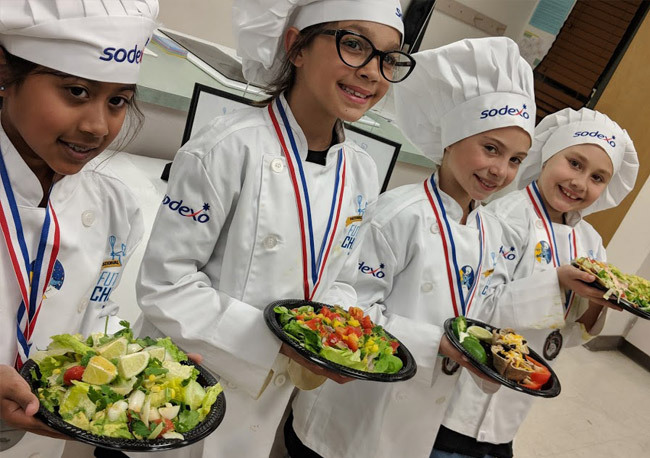 Our elementary and middle schools offer salad bars, while the high school offers freshly prepared salads—this helps reinforce "healthy" food choices. In accordance with this, we have removed all deep fryers and only serve baked snack chips and reduced fat cookies. All menus are analyzed by the NutriKids Program to ensure nutritional requirements are being met. Arizona Nutrition Network presents summer lunch buddies! All summer long we are serving up food and fun to kids 18 years and younger. There’s no cost, and no registration required. Please visit the Arizona Nutrition Network website for more information. In December of 2010, the Healthy, Hunger Free Kid’s Act was passed into law. In January of 2012, the U.S. Department of Agriculture released the final meal pattern requirements that are mandated by that law. The following documents will provide more information and answer any questions you may have regarding this program. If you have any questions, please feel free to call Food Service General Manager Julie Stratton at (480) 664.5025. The NSLP is a federal program that may provide nutritious meals to all school children at a no or minimal cost (breakfast is $0.30 and lunch is $0.40). Families may apply for the program by submitting a Household Income Application in English or Español. Please view our instructions and frequently asked questions to help fill out the application correctly. Participants must submit an application every new school year. Applications are available at any FHUSD school office or the district office located at 16000 Palisades Blvd. Please call the NSLP Coordinator, Karen Popowicz at (480) 664-5061 if you have any questions regarding the application process. Se puede recoger una solicitud española aqui, y tambien en la oficina. Want to know what’s for lunch or breakfast at your school? Please view our current lunch menus below.